Whether Bible studies are a regular part of your ministry, or you're thinking about how to bring Bible study into your ministry in a more significant way, chances are that you want to help your students enter into God's word in a way that challenges them and changes their lives. That's a goal worth working towards?but sometimes you will feel like it's a goal that you may never reach. Unleashing God's Word in Youth Ministry is designed to help you develop a Bible study approach that engages students on a deeper level---even if you're an avid curriculum user or someone who creates all your own discipleship materials from scratch. As you devour the wisdom Barry Shafer brings from decades of student ministry and engage in your own study of God's Word, you'll discover that Bible study for your students can be taken to a whole new level. In the pages of this book you'll: Get beyond the typical Bible discussions and learn to confidently engage students in an in-depth search of God's Word Teach teens how to study the Bible on their own Be invigorated in your own personal interaction with the Bible Gain confidence and competence in leading teens deeper in Bible studies, and much more! If you want to take your students deeper into the Bible, discover what it takes to unleash God's Word in your own ministry and watch your students and youth ministry be transformed. 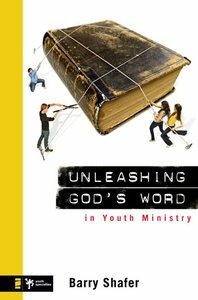 About "Unleashing God's Word in Youth Ministry"